Moravian Institute in Rajpur, Dehradun was established in 1963 by Br Eliyah Thsetan Phunthsog whilst he was undertaking the revision of the New Testament in Tibetan for the Bible Society of India. During this time he met a number of Tibetan refugees who had just fled from their homeland across the Himalayas. What blossomed over the years was a work involving a school, a hostel and a vocational training program. 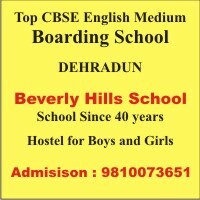 The Institute is affiliated to the Council for the ISC (Indian School Certificate) Examinations, New Delhi since 1978.